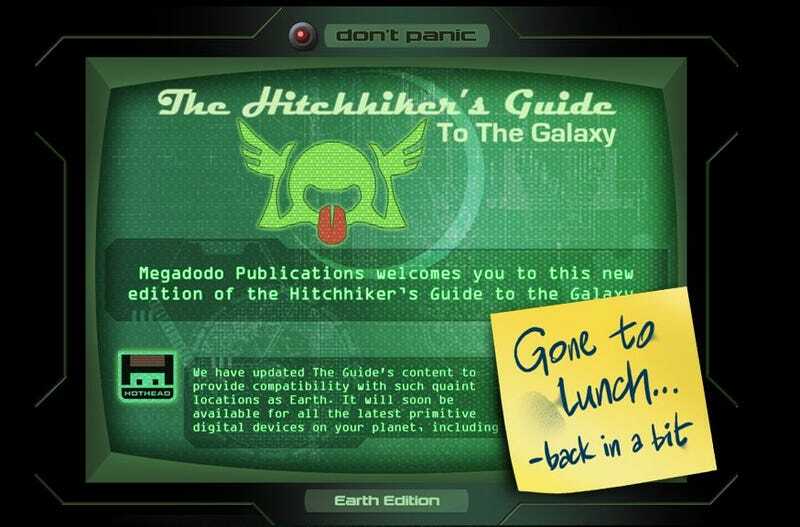 The Hitchhiker's Guide to the Galaxy, not the book about the guide and the people who use it, but the guide itself, is coming to iPhones, iPod Touches and iPads this fall, Hothead Games tells Kotaku. The free-to-download app will hit this fall as what is meant to be a replica of the interactive guide sold to travelers of the galaxy. That means readers will be able to flip through digital entries on things like the vogons, Milliways and Babel Fish. You'll also be able to read up on why it's so important to carry at towel at all times, how to survive in space and where to get a Pan Galactic Gargle Blaster. Of course, it also teaches you how not to panic. "We really focused on taking existing Guide entries and presenting them in a new, interactive way," said Joel DeYoung, Hothead Producer. "We have so much respect for the original that we had to stay true to the style of Douglas Adams, and deliver an app that feels familiar to fans, but updated for today's devices." I understand that once the guide launches, there will be updates to expand upon your and its knowledge of the galaxy and how to travel through it. All for a nominal charge, of course. "Just like the real Guide, we see this version as something that will continually be expanded and added to," DeYoung told Kotaku. "Assuming people like what they see, we want to keep adding entries as well as new interactive elements."